The Multisense and Body team aims to elucidate the relative contributions and interactions of the somatosensory, vestibular, and visual sensory systems to own-body awareness, own-body movement perception, and the perception of external stimuli applied on the body. Modulation of these bodily experiences and brain plasticity after impairment of such sensory systems is also investigated (stroke, amputation, vestibular deficits, aging). We combine transdisciplinary approaches, including electrophysiology (microneurography, cortical multiunit recordings), brain imaging (fMRI; EEG, optical imaging), and behavioral methods (psychophysics, EMG, multisensory stimulation, postural testing), in both humans and rodents. We investigate how the vestibular system contribute to whole-body experiences, in particular self-location, first-person perspective taking, and self-other distinction and mirroring (BODILYSELF Project; FINDING PERSPECTIVE Project). For this, state-of-the art vestibular physiology (galvanic and acoustic vestibular stimulation, motion platforms, electromyography) is linked with electroencephalography and cognitive science of the self, including immersive virtual environments. Another line of research is the investigation of the human vestibular cortex using scalp EEG and intracranial EEG. Studies are conducted in healthy participants, patients with vestibular disorders, and neurological patients. 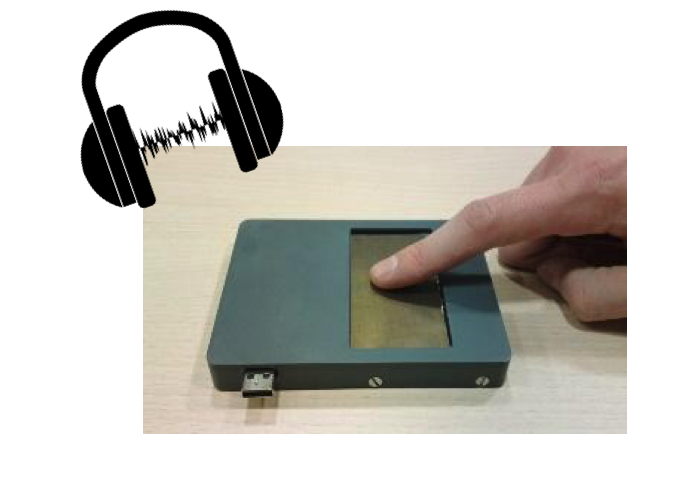 We investigate the ability of humans to discriminate tactile roughness, with concomitant audio stimulation, and the cortical underpinnings of these audio-haptic interactions by fMRI (DISREMO project, Auton-CNRS). 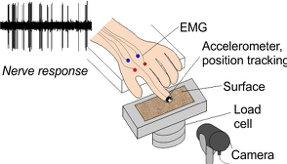 Using microneurography, we examine how single mechanoreceptors in the skin respond to complex tactile stimuli, during both passive and active movements (ARTTOUCH ERC Consolidator grant 2017). 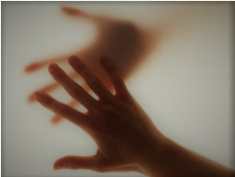 This includes applying a range of surfaces to the hand to measure how single mechanoreceptive afferents respond. Additionally, single afferents will be stimulated, using low currents, to elicit artificial sensations. The project also investigates how wetness is encoded, though tactile and thermal afferents. Body movements are encoded by muscle receptors, named the muscle spindles, the sensitivity of which may be changed by the central nervous system through the activity of the fusimotor neurons. We test the hypothesis that this central control is involved to adapt the proprioceptive encoding of movements to particular behavioral purposes, to distinct emotional feelings, as well as to the learning of new motor skills, by using the microneurographic technique. Tactile sensitivity relies upon populations of low-threshold mechanoreceptive units located in the dermis layer. We explore whether changes in skin hydration, temperature, or compliance with aging affect the encoding of roughness by tactiles afferents recorded at the median nerve level with the microneurographic technique. Time-dependent spatial representation in the primary somatosensory cortex. The sensory systems have to make sense out of ambiguous and fragmentary inputs that comes from our sensors. The illusion of tactile “saltation” suggests that successive brief tactile stimulations delivered on two different locations are felt as single object hoping linearly between the two cutaneous regions. As the primary somatosensory cortex (SI) contains a topographically organized representation of the body cutaneous surfaces, we hypothesized that stimuli representation within this map undergoes spatial distortion dependent upon the delay between two distant tactile stimuli. We test our hypothesis in rodents using voltage-sensitive dye imaging and electrophysiological unit recordings. Multisensory motion perception : how do signals from different sensory sources (visual, tactile, auditory) get integrated ? A focus on the visual motion area MT. To keep a stable and updated representation of the environment, our brain needs to take into account our own motion (self-motion) and the movements in the environment (external motion). Most frequently, when an object is in motion, it activates several of our peripheral sensory receptors. We investigate the neural mechanisms underlying the multisensory integration of motion signals, both in rodents (using voltage-sensitive dye imaging and electrophysiological unit recordings) and in humans (using fRMI). We target the visual motion processing area MT, as a candidate for multisensory motion perception. Recovery from cortical stroke depends upon a reorganizational process within the peri-infarct zone as well as more distant sensorimotor areas of the ipsilesional and contralesional hemispheres. 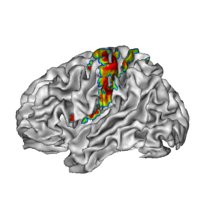 Our research project aims to gain new insights into reciprocal hemispheric influences underlying the remodeling of somatosensory cortical networks, as a substrate of functional recovery after focal stroke. We address this question to disentangle adaptive from maladaptive reorganization following focal damage to S1 in the rat. We combine immunohistochemistry, electrophysiology, voltage sensitive dye (VSD), and correlate cortical remodeling with the recovery of sensorimotor abilities. Vestibular disorders are common and involve deficits in postural and oculomotor control, and in spatial cognition. Our studies focus on aspects of vestibular symptoms that were overlooked: abnormal bodily and self representations. Neuropsychological and neuroscientific investigations aim at unravelling the multisensory, psychological and neurological factors that may lead to distorted body and self representations, and how they compensate. 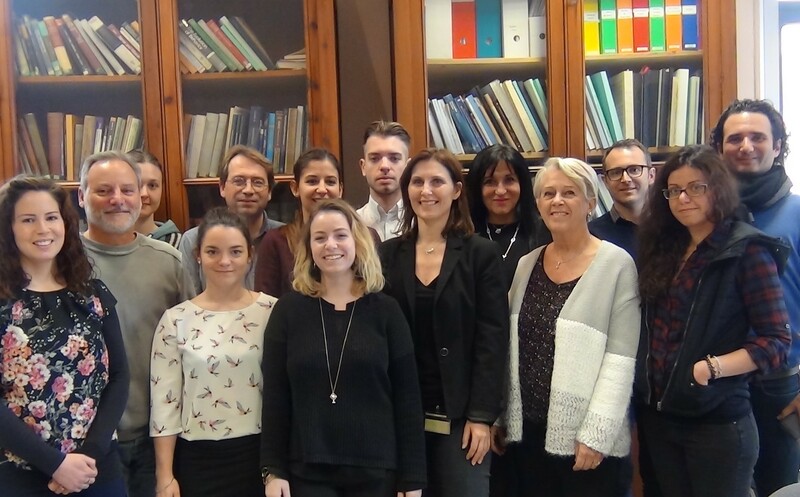 This may improve the diagnosis and treatment of patients with otoneurological disorders (BODILYSELF Project).